The road to web content writing of rich SEO infused articles and blogs for your website is not always straight. At times, this can be confusing, follow these tips to better results while writing content for your website. The First Deadly Sin of SEO: Exclusive use of Pay-Per-Click (PPC). Many small business owners are enamored with Google’s AdWords. AdWords allows them to directly target those interested in their product or service. It makes sense to use advertising that is initially free and you only pay when it is used. However, the wise business owner uses a balanced strategy. 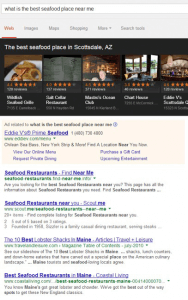 This strategy should include both PPC and organic search results to get their business noticed. When you use a marketing strategy that places too much faith in a system that gets results only six percent of the time, you are losing out on a very large audience of prospective customers. To make the most of your advertising, utilize rich web content writing on topics that promote your business. Use relevant keywords or phrases, focus keywords, synonyms, and surrounding text to prove your site is selling what the searcher needs. Google’s Hummingbird algorithm uses all those factors to determine where your page belongs on search engine results. Consider the article written by Hardik Sondagar for Quora, How does the Hummingbird algorithm work? His illustration was one of the best I have read. 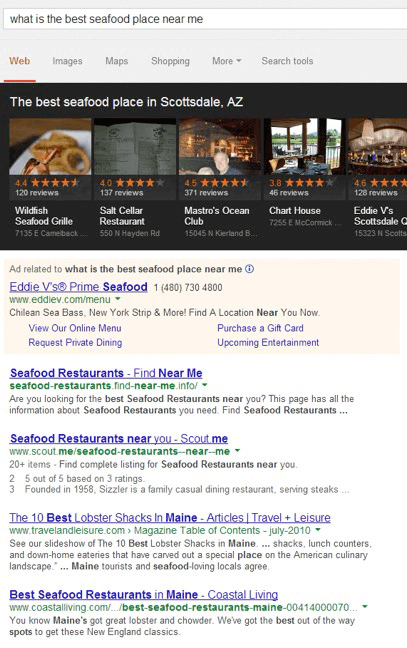 Notice how the algorithm correctly surmises the searcher is looking for a seafood restaurant in the first two search results? However, it incorrectly surmised that “me” is the state abbreviation for Maine. That is how comprehensive the algorithm is, your writing should match that level of clarity. The Second Deadly Sin of SEO: Incorrect configuration of the Content Management System (CMS) or Improper Maintenance of a website. WordPress celebrated 10 years of existence in 2014. WordPress is the most widely used open source (free) CMS on the planet with nearly 60 million users. However, if WordPress or any website is not configured and maintained properly it will slow down. Non-optimized images, videos directly uploaded to your site, and conflicting plugins will cause a site to open slowly. Optimize all images using JPEG Mini, Puny Png or another image optimizer before uploading. If you have many images on your site already, use WP Smush to optimize all of those. Avoid uploading videos directly to your site, use YouTube or Vimeo instead and embed. When you directly upload a video to your site, every time someone shares or embeds that video you become the host. This will drastically slow your load time, which you don’t want. The average searcher will wait two or three seconds before moving on to the next entry on the search engine results page (SERP). The Third Deadly Sin of SEO: Duplicate content is not that deadly! Edit, add to, and republish previous content to give yourself the “most bang for your buck”. Instead of writing new material, or hiring someone to write new content, re-use the content on your site that is still relevant. When I regenerate web content writing I have published in the past, I read the comments to ensure I address any concerns or updates. By doing this, I can address my readers concerns with the original content. When writing for the web, we cannot possibly keep up with every update or new release regarding what we have written. An excellent article regarding duplicate content was written by Kissmetrics, 3 Myths About Duplicate Content. The Fourth Deadly Sin of SEO: Not utilizing Social Media to its Fullest! The notion that only a little more than half of all small businesses are using social media seems like a waste of a valuable asset. There are approximately 3 billion people using Facebook and billions more using YouTube, LinkedIn, Twitter, Pinterest, and others. Why not tap into that market to promote your business? Most of these platforms allow free advertising, while others charge less than $5.00 to boost your post to reach tens of thousands of local users. At the very least, you should have a matching Facebook Business Page linked to your website. Utilize web content writing strategies to include more social media platforms. The Fifth Deadly Sin of SEO: Not investing enough time or money in SEO. Your web content writing should be SEO infused for every article or blog on your website. When you consider the facts above, there is no better Return-on-Investment (ROI) than well-written content. You must keep a reader on your site long enough to answer your call-to-action (CTA). Actually, you should hire someone to write content for you and concentrate your efforts on the business. Web content writing of articles and blogs that promote your business with relevant keywords and keyword phrases, along with a fully-optimized website will eventually get you into the top five of search engine results. The Sixth Deadly Sin of SEO: Ignoring the Potential of Blogging. Inbound links and site visitors are the exact reason for maintaining a website for your business. In order to get people to visit your site, you need relevant dialogue that attracts readers. Although writing a blog about your business seems like a lot of work, it is perhaps the cheapest form of advertising. If you do not have the time for web content writing with a blog, outsource it to a freelance writer. The Seventh Deadly Sin of SEO: Not focusing on the User. This survey points to the largest group of users for blogs, the 21 to 35-year old age group. It is wise to speak to the people you believe to be the most interested in your product. If you sell adult diapers, for instance, that age group would definitely not be the right age group. 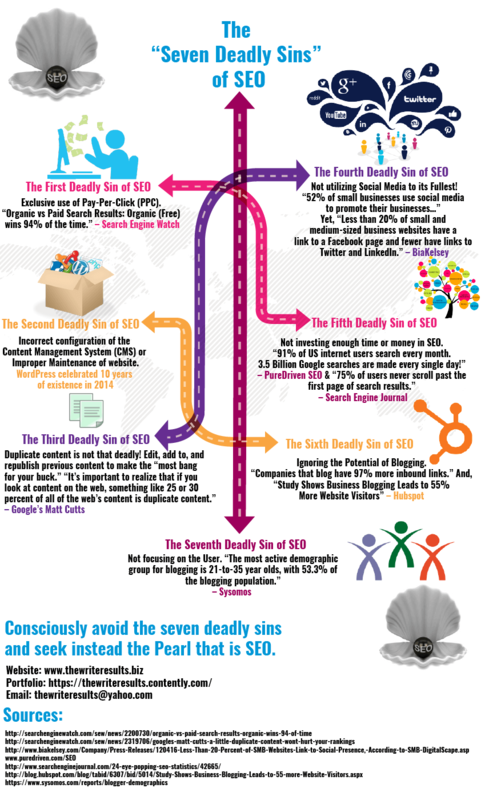 Consciously avoid the seven deadly sins and seek instead the Pearl that is SEO. After looking at my portfolio, ask yourself is this the type of talent you need writing for your website. Then, fill out a contact form to get a quote. Web content writing is an art that requires research, organization skills, impeccable grammar, and SEO insight. I do not develop web pages, I fill those pages with rich, SEO infused content.